The nice folks at Bee Tees sent each of my three kids shirts. I'm not sure if they did so because they read this blog and thought my sometimes cantankerous trio could use good behavior reminders, but the shirts are cute as hell and my kids think they're great. I especially appreciate a kid with autism like Leo getting to run around town with a t-shirt that declares: "Bee Yourself"! And the fact that the BeeTees folks also do custom Bee-Cause designs for fundraising. SEPTAR could certainly benefit from a design option you might easily guess. Big sister Iz swiped his shirt later on. 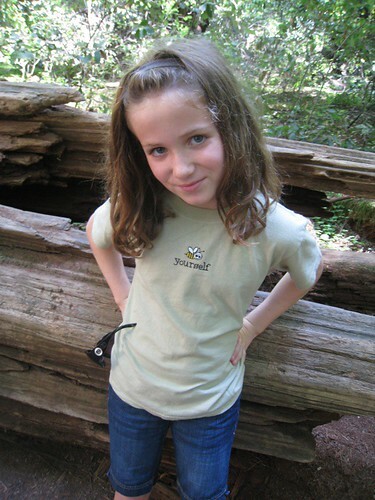 She says she's the one who is entering middle school in a few weeks and needs tools like a "Bee Yourself" shirt to remind her about priorities and bucking peer pressure. Her shirt actually fit him better, so I didn't mind letting them swap. 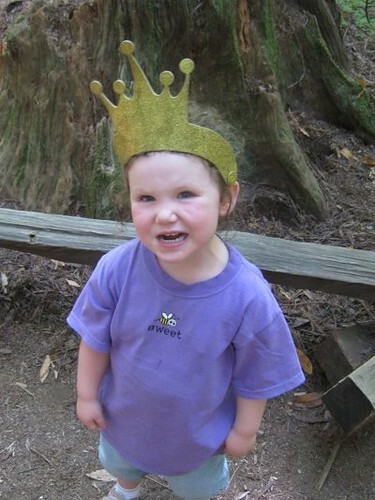 Mali got the same shirt design Iz was supposed to wear, "Bee Sweet." I think it's appropriate. Mali has full-tilt Defiant Little Sister Syndrome, so anything that reminds her to be nice is appreciated (Bee Kind, Bee Happy, and Bee Good would also be options; as her mom I consider Bee Unique self-evident). 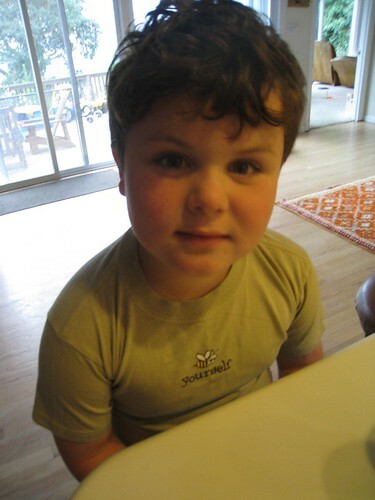 Iz complained that Leo's the one who needs the Bee Sweet shirt anyhow, as he's been going after his little sister again. I let him wear it not because of her griping but because most eight-year-old little brothers could use such a reminder. Plus at Leo's team meeting today, we had two main discussion points: 1) How close he's getting to reading -- we think he might be doing some real work by the end of the year, in which case shirts with one or two words on them can help reinforce reading skills, and 2) The importance of using very firm and direct language and a commanding tone of voice with him when he misbehaves, to help him understand when he is doing something that is not okay. If we want him to be sweet, we have to be firm. Regardless, these are truly very cute shirts, and I'm glad to know about them before the holiday shopping season starts. I know quite a few kids who could use or would appreciate them. And I might just get a Bee Unique shirt for myself. 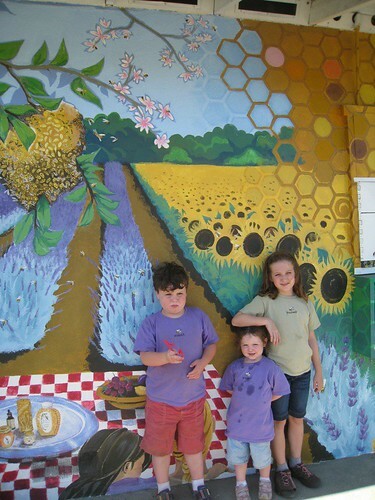 The kids and their BeeTees in front of a bee mural at the BeeKind apiary products & supply store in Sebastopol. I can't believe Iz is starting middle school! How is she feeling about that? I'm new to your blog...but wanted to say that I love these shirts, and your writing too of course! Beautiful children. I too have a soon to be sixth grader who could use a bee yourself tee. @Grace Thankfully her school is grade 3 - 8, so middle school is a mostly mental transition. No mixing it up with a group of entirely new kids at her most socially vulnerable time. *WHEW*. She's excited. @MB Perhaps you could send pix of your own wonderful crew? Lovely to hear from you all. Yes, I will be there on Thursday! SO looking forward to it. I did not notice our kids were the same ages. I will definitely go to Shenkinators site. I am very active in (used to run) the Bay Area PWS support group...there are a lot of us 'round here! I hope I can be a resource. Thanks for connecting me, and hope to meet you Thursday. Great reading recognition value in these shirts with short words & images. Love this! Would be good for my gals, 4 & 6.